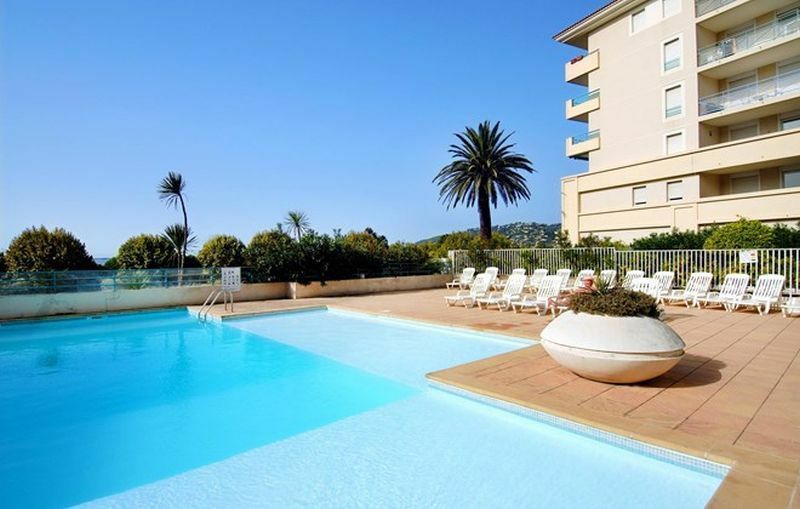 Juan les Pins is characterized by a fantastic coastline with a wide variety of sea views, various gardens and a hinterland with authentic charm. This is a lively resort and offers various possibilities to discover the beauty of the coast and the Côte d'Azure. It is located between Cannes (7km) and Nice (22km). The residence is located in a pedestrian zone, opposite the sea at 50 m from the shops. It has direct access to the sea via the Exflora Park (100m). The apartments are part of a 5-storey building with a U-shaped elevator. This residence offers everything you need for an unforgettable holiday on the French Riviera. This studio with extra room is suitable for 2-4 persons and has an area of ​​approximately 29m2. It consists of a living room with 2 single sofa beds and an extra room with a bunk bed and window. The property also has a fully equipped kitchenette with an oven, electric hob, fridge and dishwasher and a bathroom with toilet. Each accommodation also has a terrace or balcony with garden furniture. Furthermore, the following are at your disposal: non-heated outdoor swimming pool (open from May to September), free TV, safe (for a fee) and an underground parking space (with limited spaces) for an additional fee. Payment for additional services must be paid locally. The residence is located in the pedestrian zone, opposite the sea, 50 meters from the shops, with direct access to the Exflorapark (100 meters). As a guest you can use the unheated outdoor pool open from May to September, solarium, underground parking for a fee with a limited number of places. A TV is available in the accommodation. For an extra fee you can bring bed linen, towel set, baby kit with bed, bath and booster seat, final cleaning and parking in the parking garage from 33 to 45 euros per week, depending on the period, limited number of places, booking. You can also reserve a safe for 2 euros per day and 9 euros per week. Deposit and tourist tax must be paid on arrival. The deposit will be returned to you on the day of departure after the inventory or by post. You must leave the accommodation spotless, if not, you will only receive a part of the deposit. Small pets are allowed for an extra fee, provided they have a valid vaccination certificate and tattoo, if they are kept in the residence. A holiday in the Open Pins Blues residence offers you the unique opportunity to enjoy the excellent location (overlooking the beautiful blue Mediterranean Sea) and all the possibilities that are associated with it. Some places that you should visit include Fort Carr��, Le Jardin Exflora, the Picasso Museum, the Peynet Museum, Cannes, Nice, Monaco, Vallauris and the Lérins Islands. Here you can enjoy a number of water sport activities and a number of walks. Local cafés, restaurants, casinos and discos make your holiday complete in this beautiful destination by the sea. Enjoy Open Pins Blues and the best vacation of your life!